Do you spend time refilling your brewer daily? 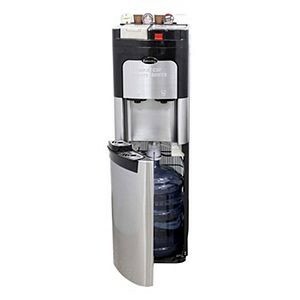 Our commercial single serve coffee brewer uses a water cooler to refill itself, so you don't have to. Uses a normal 5 gallon water bottle, good for 80 cups of coffee! Compatible with the many beverage types available in K-Cups®*. Engineered for commercial use, this robust coffee brewer is made for non-stop use in cafés, restaurants, offices or busy homes. As the brewing temperature is 9°F to 31°F hotter than other single serve brewers, the coffee comes out aromatic, with taste fully developed, like at your favorite coffee shop. Your cup is brewed in just over 40 seconds, about twice as fast as other brewers. Our patented Thermoregulator&trde; technology keeps the hot water at a steady 201°F, the ideal brewing temperature for a rich, smooth cup. Quick select buttons for 6 oz., 8 oz. and 10 oz. mugs are a welcome feature. Our FeatherHeat™ technology slows calcium buildup, reducing descaling to yearly, instead of monthly. About 85% of the front is appliance grade Stainless Steel to complement your kitchen, café or office. Iceberg Thermoregulator™ technology uses ice to keep the cold water at a steady, frigid 40°F. Typical water coolers fluctuate from 40°F to 50°F, not cold enough most of the time. Magma Thermoregulator™ technology uses a super heating chamber to keep hot water at a steady 194°F, unless in coffee mode, then the temperature is maintained at a steady 201°F. Typical water coolers fluctuate from 170°F to 197°F, not hot enough to make proper tea most of the time. * K-Cup® is registered trademarks of Keurig, Inc. a subsidiary of Green Mountain Coffee Roasters, Inc. Estratto is not affiliated with Green Mountain Coffee Roasters or Keurig.